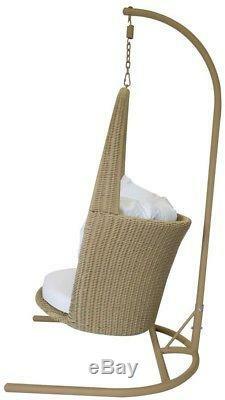 Garden Bistro Hanging Chair Hammock Swing Seat Rattan Natural Porch Patio Charm. Dimensions: H196 x W77 x D81cm. Seat size: 65 x 65cm. Height from floor to seat: 40cm. 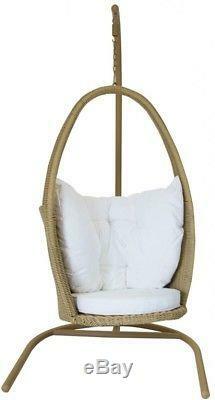 Take some time to chill out in the garden in this comfy rattan swing chair. Boasting a minimalist design, this swing seat will make a stylish statement in your outdoor space and provide the perfect spot to lounge in. This chair is finished with a safety belt and a thick white cushion so you can really sink in and swing gently back and forth. Crafted from highly durable woven rattan and a strong steel frame, this hardwearing chair is showerproof so it will surely remain a beloved feature of your outdoor space for a long time to come. Long-lasting Sturdy and robust, this showerproof chair is suitable for outdoor use. Elegant The natural coloured frame is beautifully complemented by the white cushions. 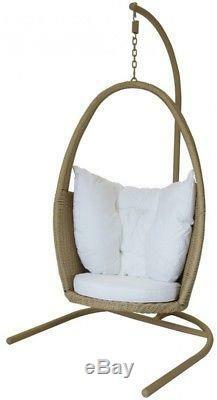 Relaxing Fitted with a safety belt that controls the swing range, this seat rotates and swings gently and comfortably. Please note : We recommend covering this chair overnight and through the winter months to ensure longevity. Customer service is our top priority! Please be sure to read the description thoroughly to make sure that this is the item you want before making a purchasing decision. We make every effort possible to accurately describe and depict the items. Please be aware that slight variations in color may be due to differences in lighting and computer monitor resolutions. Thank you for shopping with us. An adult signature will be required. Please be sure to have available help on hand to assist you with moving the item to the desired location in or outside of your home. Deliveries are to front door only & not to room of choice or into the property. Deliveries to flats or apartments may only be made to ground floor only. Only factory defects are accepted as a reason for a return. In the case of factory defects, if available, we will replace the product for you. When returning an item, it must be in all of the original packaging and include all of the original accessories or items that came with it. The item and package should be in original and perfect condition. We do our best to process as quickly as possible. Orders are processed immediately and dispatched to fulfillment as soon as they are received. For this reason, we are typically unable to honor cancellation requests. If the order has gone too far through the fulfillment process, we will be unable to cancel. Listed by Sku Grid Listed. The item "Garden Bistro Hanging Chair Hammock Swing Seat Rattan Natural Porch Patio Charm" is in sale since Saturday, June 16, 2018. This item is in the category "Garden & Patio\Garden & Patio Furniture\Garden Chairs, Swings & Benches". The seller is "webbargain" and is located in Multiple Locations. This item can be shipped to United Kingdom.